An ironic turn of events will see cycling fans yet again denied a showdown between Classics heavyweights Tom Boonen and Fabian Cancellara at Paris-Roubaix on Sunday, April 7. Boonen won’t defend his title having crashed some 19km into last week’s Tour of Flanders. Twelve months ago it was Cancellara who fell heavily in Belgium and was unable to start the highly revered Hell of the North. 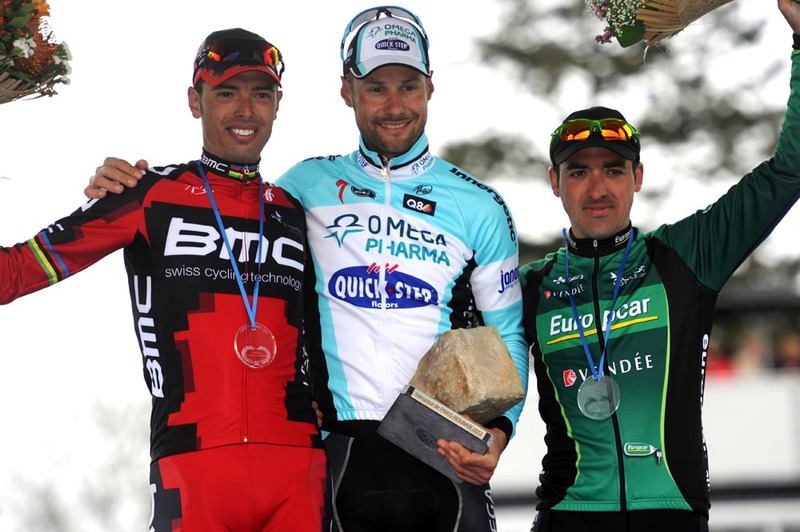 Omega Pharma-QuickStep has failed to repeat its spectacular 2012 cobblestone campaign that saw Boonen take virtually a clean sweep winning E3, Ghent-Wevelgem, Flanders and then Roubaix. In a stark contrast, the latter race this year presents a last opportunity for the team to salvage some if its early season with Frenchman Sylvain Chavanel, who animated Milan-San Remo and won the Three Days of De Panne late last month, a possible team leader. Roubaix similarly marks Team Sky’s final chance to secure the one-day victory it craves. Its Classics squad has been working cohesively together since December and, in a new approach, has substituted some racing for training in preparation. Key riders have bought into the gamble, which is heavily backed with sports science, but are yet to celebrate a major win. Geraint Thomas has been in the mix on two occasions – at Milan-San Remo and Flanders – but at both has been involved in a pile-up at the most inopportune time. He and Ian Stannard could light up this weekend’s 254km epic that includes 27 cobbled sectors. British national road champion Stannard excels in cold condition, which have characterized most one-day events this year. Cancellara suffered skin abrasions in a crash at yesterday’s Scheldeprijs but is still an outright favourite, and will have support from his in-form RadioShack-Leopard team. If successful, the former time trial world champion will mark his third race victory. Emerging American Taylor Phinney is set to play a role for BMC and will be one to watch. Lotto Belisol demonstrated exemplary teamwork at Flanders to put Juregn Roelandts on the podium in third. Surprisingly, his teammate, prolific sprinter Andre Greipel, chose to skip the bunch sprint friendly Scheldeprijs ahead of Roubaix. The move suggests the team may yet again have a noteworthy action plan. It’s the cobbled sections of farm tracks – pavé – that give Paris-Roubaix its unique character. Certainly, other races feature cobbled sections – not least the previous weekend’s Tour of Flanders – but nowhere near the 50-plus kilometres of roughly made roads in the 254km route. It’s no wonder the race is nicknamed the Hell of the North. 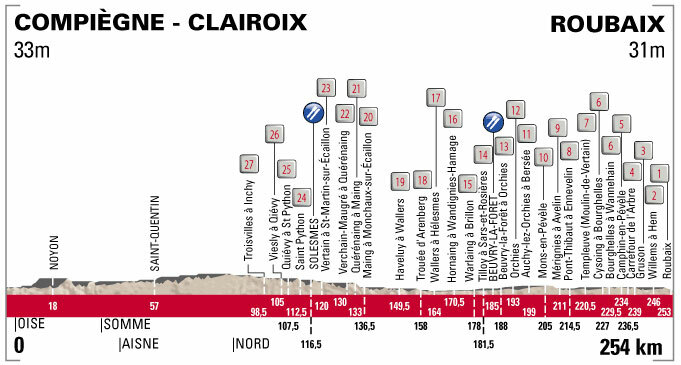 The riders have just under 100 kilometres to get into their rhythm as they travel north from the start in Compiègne before encountering the opening section of cobbles, Troisvilles à Inchy. From there, it’s a relentless spell of tarmac and cobbles until the very final pavé section right before the race finishes in the iconic Roubaix velodrome. Trouée d’Arenberg is perhaps the most well known of the pavé sectors, a brutal stretch lasting 2.4 kilometres that can literally make or break a rider or their bike. Rain and vicious crosswinds can also play as much a part of the race as the cobbles, although the weather forecast for Sunday is for it to be dry, clear and short on winds.